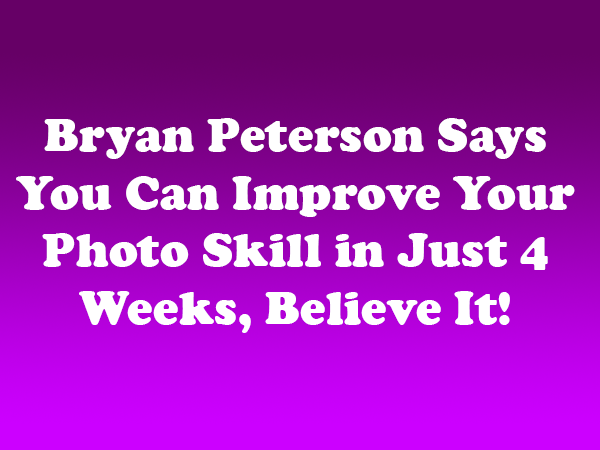 Books Bryan Peterson Says You Can Improve Your Photo Skill in Just 4 Weeks, Believe It! Understanding Exposure, by Bryan Peterson is a classic “must read” for every serious beginning photographer. The latest edition of the book is now available in hardcover. As on line classes became popular, Bryan Peterson started the Picture Perfect School of Photography (PPSOP). Without doubt it is one of the best online photography schools on the internet. Its founder, Peterson brings more than 30 years of professional photography and teaching experience to his classes. His instructors teach with the same clarity that Peterson uses in his books that have made him so popular. While there are a variety of YouTube videos and tutorials available online, the primary benefit of the online classes is performing the assignments and receiving thoughtful feedback from the instructors. The eight-week class unravels the often confusing and intimidating world of exposure. The four-week class teaches students how to make the most of flash photography using their specific brand of camera. This four-week class leads students from a basic understanding of layers to more advanced applications of layers in image compositing and special effects. PPSOP also offers classes catered to special interests, such as portraits, fine art photography, nature and landscape photography, and travel photography. All classes take place over the Internet. Each week, you receive a new lesson that typically features reading material, videos, and sample photography. You then have 10 days to complete your assignment. When your project is complete, you upload the photos to the PPSOP website and your instructors provide an honest critique (no sugarcoating) of your photographs. You are also able to correspond with your instructors during any point of the process via email. And the best part, all PPSOP classes offer a 100% satisfaction guarantee. For additional books by Bryan Peterson, consider reading Understanding Shutter Speed, Beyond Portraiture: Creative People Photography, and Learning to See Creatively.